Before I dig into my findings, it’s important to understand what NVMe is and what the interest is. 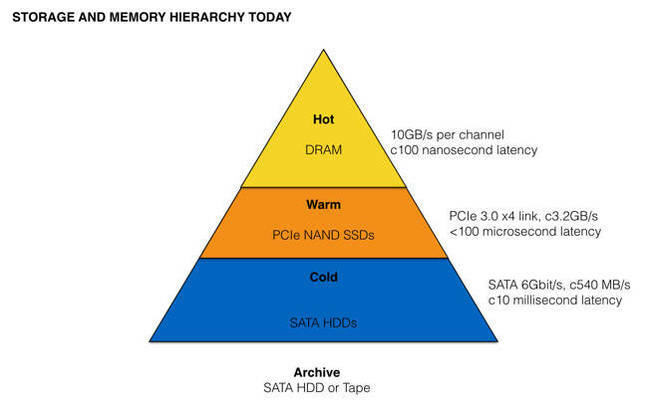 NVMe, or Non-Volatial Memory Express, is defined by Wikipedia as “flash memory that comes in the form of solid-state drives (SSDs) [with] a logical device interface, [that] has been designed from the ground up to capitalize on the low latency and internal parallelism of flash-based storage devices, mirroring the parallelism of contemporary CPUs, platforms and applications.” NVMe removes the traditional storage controller and communicates directly with the CPU via PCIe thereby allowing substantial performance gains versus the traditional SSD via SAS connectivity model. Below is a chart of what you can find for your blade server needs from the Tier 1 vendors. For details, reference the links in each listing. Also, please contact your vendor for specifics as certain configuration restrictions may exist. As with most things, the application use is going to drive the configuration. If you have a need for high IOPs close to the CPU, then NVMe might be the way to go – however be prepared as most blade designs will be limited to a few drives, so talk to your vendors or your partners and talk through your options. As always, if I have omitted any options, please let me know. Thanks for reading. If you have suggestions on future topics, please comment below. Ideas, comments or errors are greatly appreciated! Kevin Houston is the founder and Editor-in-Chief of BladesMadeSimple.com. He has over 20 years of experience in the x86 server marketplace. Since 1997 Kevin has worked at several resellers in the Atlanta area, and has a vast array of competitive x86 server knowledge and certifications as well as an in-depth understanding of VMware and Citrix virtualization. Kevin has worked at Dell EMC as a Server Sales Engineer covering the Global Enterprise market since August 2011.